The Project Learning Garden team have been busy recruiting and training schools in Merton, Bexley and Southwark while gearing up for the first growing season of the project in London. Project Learning Garden provides starter kits to schools with everything they need to start or refresh a food growing garden and use it as an outdoor classroom. 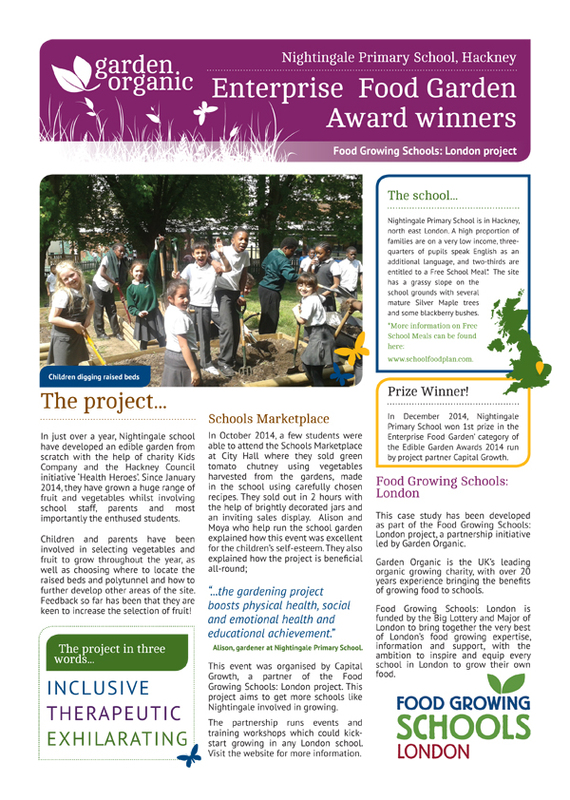 Project Learning Garden provides schools with hands-on training, curriculum linked resources, raised beds and gardening tools, a fully equipped mobile cooking cart and ongoing support and guidance. Despite the snow in March, they held two training sessions to meet with teachers and other school staff to start to work on planning how to link a school garden to their curriculum. The sessions covered curriculum, organic gardening, basic cooking skills and working with groups outside. The team running the workshop were joined by former Blue Peter gardener Chris Collins and Master Gardeners in Southwark. The schools will soon be receiving their ‘kits’ which include a selection of cooking and gardening items as well as raised beds and lots of activities and resources to deliver the curriculum. Schools also have access to a range of lesson plans and activities which link to environmental themes and subjects across the curriculum. To find out more about PLG visit the Garden Organic website here. Garden Organic, the UK’s national charity for organic growing & the Captain Planet Foundation (CPF) a charitable organisation based in Atlanta, USA, are working in partnership to bring their successful Project Learning Garden programme to the UK. Seeds of Change®, who donate 1% of sales to research and promotion of biodiversity and sustainable organic practices, are generously funding this pilot project, making this new partnership possible.